I learned this recipe from a friend a while ago, and I really liked the contrast between the soft and flavorful interior, and the crunchy sweet crust on top. Enjoying this recipe with family and friends is a new tradition for my holidays. 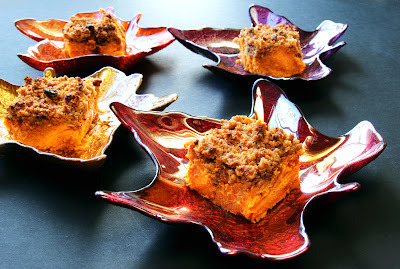 - Cover the sweet potatoes in aluminum foil, and bake in the oven until they are soft (it takes about an hour). When done, remove the skins, and mash with a fork or with a hand mixer. Let the oven stay heated at 400F. - Separately, whisk the eggs, then add the vanilla extract, the cup of sugar, salt, and the evaporated milk. Add over the mashed sweet potatoes. - Melt two of the butter sticks in a pan, then combine with the sweet potatoes. Add the nutmeg and the cinnamon, and mix till uniform. - Take the baking pan where you will cook the dish. You still have half a stick of butter - use a bit of it to coat the pan. Following, add two-three spoons of flour to the pan, and distribute them uniformly (they'll stick to the butter). This will prevent the dessert from sticking to the pan. - Melt the remaining butter (after the coating is finished), and mix with the chopped walnuts, the flour, and the brown sugar. - Carefully place the sweet potato mixture in the pan, then top it with the walnuts crumbles as prepared at the previous step. Bake in the oven for 50-60 minutes. - Remove from the oven, let cool overnight, then store in the fridge. Serve cold. - The dessert is easiest to cut when cold. Still, you'll need a lot of patience to carve out some nice slices. - I love the leaf-shaped plates I recently bought, and I think they're perfect to present this recipe. In general, I think fall colors are perfect to complement this dish, particularly red, gold, or a reddish brown. - You can alternatively place some fresh cranberries next to the dish, some caramelized nuts, or a stick of cinnamon and a white vanilla flower if you find it easily.